My plan was perfect I’d target the sweet tooth of a child with the aroma of candy and gingerbread cake. A combination a kid with an empty or full stomach can’t resist. 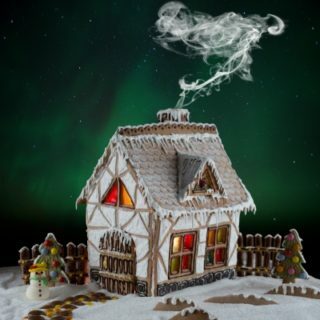 And all unsuspecting of his or her fate to become part of my gingerbread and candy house. It is easy for me to this day to vividly recall the sight of children coming to my edible house and taking their little hands and grabbing at the candy stuck to it. Once I saw their mouths full I would call out, “Who is eating my house?” You can imagine the shock in their faces and their eyes like saucers…those were the days. My little game went on so well until two children came along brother and sister, Hanzel and Gretal. I got this little feeling as I reeled them something felt off but I shoved it aside. I only thought of fattening them up as quickly as I could and making them additions to my house. If only I had slowed down, thought things over, but no I allowed my hunger to turn these two siblings into gingerbread best me and even worse than I lost my pearls, precious stones, gold, silver; all items belonging to me to those those…greedy brats… I could only watch them as I stood cooling down after being turned into a fresh gingerbread cookie. All sorts of villains escaped doomed fates just like Wile E Coyote and Yosemite Sam because their writers made sure they came back again and again just so they could put Wile and Sam through the same disasters. If only I had been smart to negotiate for a repeated return then found a way to out of my writer’s shenanigans to not just defeat the children but him too! I tell you if I had just done this I would still be having little children coming to my gingerbread house instead of my miserable fate as a permanent feature of my house with no way to return and triumph.